The following is a diary of the event mainly focused around my personal trials and tribulations from the 9 day competition. The day had finally arrived, I de-rigged the club’s LS4, hitched up the trailer and I was off to my first gliding competition. They always say preparation is the key, well with just 5 cross country flights under my belt, only one solo aero tow and no retrieve crew it could be said I was far from prepared for what I was about to experience. At least I wasn’t going to be alone, there was a contingent from SoAGC also participating – Dan Brown with his Lak 19, Mike Coffee and his LS10 and finally the Kerby’s with their Duo Discus. As Dan had flown many comps recently he was our unofficial team captain and made sure we (well mainly me) knew what to do, reminded us on the rules and comp procedures, and offered various tips for the week. As I had no chance of winning I had set myself a few targets of my own to try and achieve throughout the week. Day 1 of the competition and with unpredictable weather expected a 2hr Assigned Area Task was set with the plan to fit it in between the passing fronts. 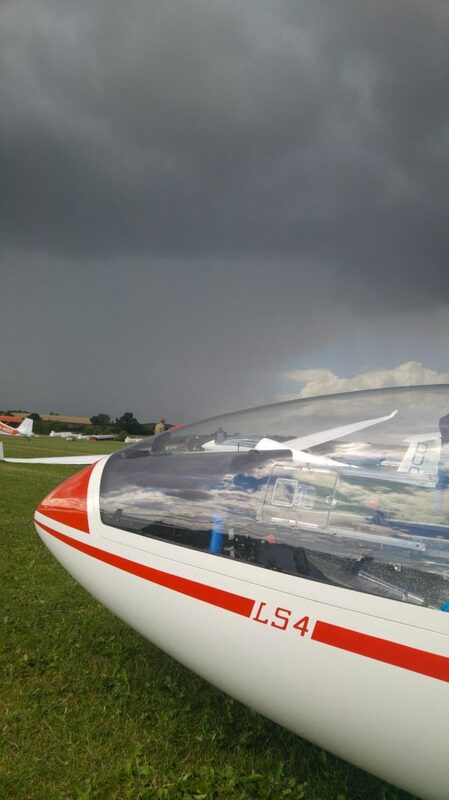 As I had never flown an AAT I was glad the rain kept coming and the comp director finally scrubbed the day at 15:30. Day 1 of my comp complete and so far I was joint first – this competition malarkey was easy! Unfortunately I couldn’t rely on the rain to keep me in first position. The sky wasn’t that appealing and nor was the forecast as it predicted an early cut off from the west and to make matters it was rather breezy. Once airborne it was case of hanging around high waiting for the start gate to open. This was my initial issue, I was struggling to stay high and once the gate had opened I wasted valuable time getting back to a good height to start the task. I was probably last to call start and off I went towards the Malverns. The first part seemed to go quite well and I made some good progress. However it looked extremely gloomy beyond the hills, just where I needed to go. The forecast cut off was turning into a reality and after tuning Burley Gate I was soon trying to spot good fields. A very hard task in itself as west of the hills there is literally only a few average ones at best. I really needed to gain some height and resorted to trying a spot of ridge soaring ( a first for me apart from flying our “ridge” at Snitterfield) . I left the hills and finally found a thermal to take me east and closer to better land out options which was good as I was soon down in the weeds again preparing for my first field landing. After much scratching I got away and realised I was high enough to make it back to Bidford safely. I opted to abort the task and to head home as I had enough drama for one day and there wasn’t enough time left in the weather window for me to get around. 24th Me After completing 88km of the task. There’s not a lot I can I say about this. I was dropped into a very grey featureless sky and I wafted around trying to hunt out some lift. I was too cautious to go out of gliding range before the start gate was opened and so it wasn’t long before I was calling downwind to land. To my fortune the gate opened whilst I was in circuit and because I landed long I completed 370m of the task after crossing the start line during finals. I was gutted to find 2 pilots recorded shorter task distances than me! 28th Me – Completing 0.37km! We were treated to another uninspiring day and it was only at 15:30 the sky became vaguely promising to launch the grid. I decided to refuse my launch (I wasn’t the only one) as I was reluctant to repeat the previous day’s achievement. So I pushed my glider out of the way and to the back and watched the lack of progress of those who had taken a launch. The gate had opened and I continued to sit out until I finally thought I better give it a bash. It was 17:10 when I finally crossed the start line (the last one again) and I set out on what I knew would be a one way journey. I only managed one decent climb on the task and that was enough to get me around the Bromsgrove TP. From then onwards my aim was to ignore the task and get myself back to Bidford somehow. This was tall order as the sky had now died and so it wasn’t long until I was looking for fields. After pre-selecting an ok one I was setting myself up for a circuit until I spotted a perfect field and so re-set myself for that one. It was an uneventful landing into an empty cow field near Abbots Morton. The only issue was the cow muck flung up on the underside of the fuselage. Phil C had been tracking my demise on Spot the Glider and so he was soon over from work to gloat de-rig. (thank you Phil for your help) A quick call to Dan and he rocked up with trailer as I was only about 6 miles from Bidford. The 3 of us soon had the glider packed away and back at the club. It was good to finally get a field landing under my belt and it helped me relax a bit during the rest of the week. The farmer’s son was initially a little concerned that I may have had spooked the cows in the adjacent field but once he had come over to see the glider he was fine. In the past they have had issues with helicopters and hot air balloons scaring the cows. The following morning I left them a bottle of wine and some beer for any inconvenience I may have caused. I decided this would be the day I would try flying with water and so I put in a barrel a side ( 50kgs total). As I was near the front of the grid I had to wait for over an hour at cloud base before I could start. It was relatively straight forward, I didn’t push too hard as I wanted to complete the task and I didn’t like the idea of landing out near Oundle and asking for a really long retrieve. 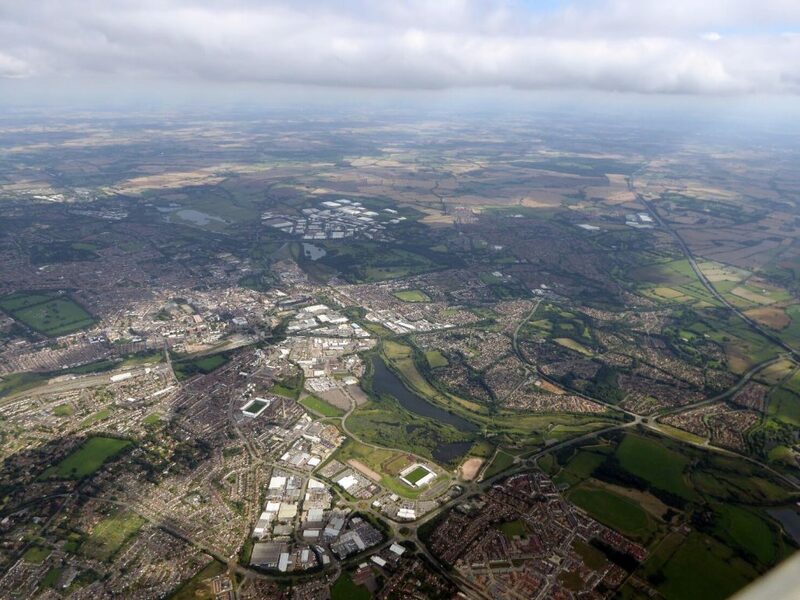 There was a moment when I did struggle over Kettering and I was down to 1800ft AGL. However Dan was nearby and calling a good climb on the radio. I therefore back tracked a few Km to use his thermal to get me out of trouble before continuing with the task. 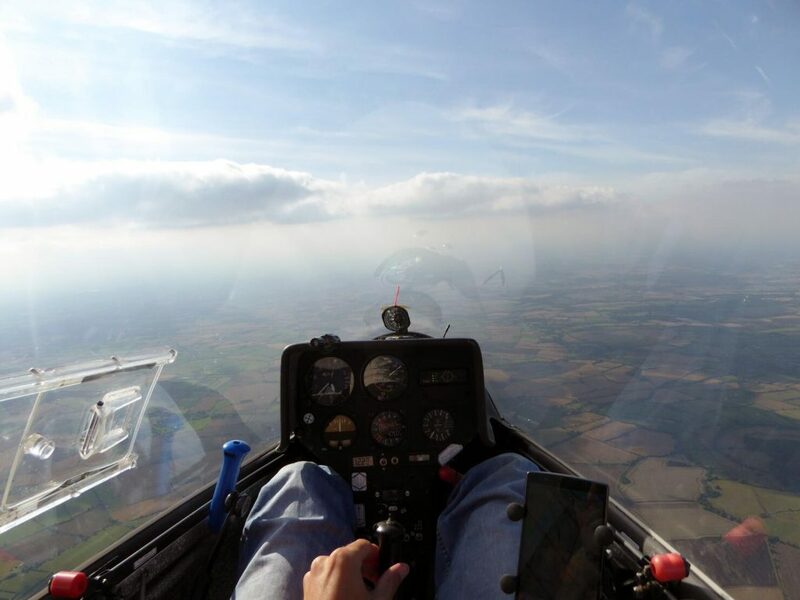 The sky was beginning to go a bit flat as I was on my way back from Olney and so I kept topping up regularly until I was on final glide. I had plenty of spare height and so did my best to burn it off eventually flying at VNE through the finish line dumping my water as I went. Scrubbed – therefore it was a day of Pool and Darts. 1st Me – Shame I’m not as good as comp flying than I am at pub sports! I struggled once the gate had opened with a strong head wind and with loads of sink I kept finding myself in. A couple of times I pushed forward only to find myself drifting back to the safety of the airfield when I couldn’t connect with any decent lift. I was just about to give up and go into circuit after the 3rd attempt when I hit a strong thermal and soon gained 3000ft out of it. There was street ahead so I called a re-start and headed for it. This line of lift got me to Droitwich at which point the sky developed into a classic soaring vista. From then onwards it was quite easy and I upped my speed culminating in a 36km final glide finishing with a 130+ kts competition finish over the airfield. As it was the last day of the comp I was hoping they would set a smallish task in order that everyone would be back in reasonable time before heading home. It wasn’t the case as with RASP showing a cracking forecast they gave us Thursday’s task to undertake again. When I launched the conditions were already great so as soon as the start gate opened I headed out on task. I soon got myself into a rhythm and put into practice what I had learnt during the week and from the Aim Higher course I attended in June. For once it felt easy and I was soon ticking off the km’s whilst keeping my task speed in the 80’s kph. However this wasn’t going to last as when I got close to Husbands Bosworth the sky started to become overcast and after I turned LES it was 8/8th on the route I had to take (this was not in the forecast!). From then onwards it was a real struggle to search out the thermals and if it wasn’t for others marking them I would have been on the deck. By staying high I tip toed around the next part of the task. 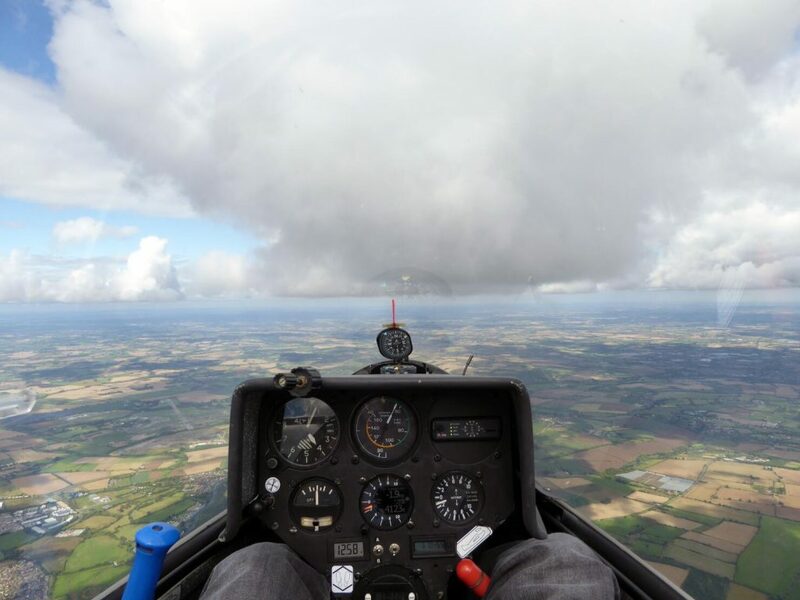 I was glad for the change of conditions over Northampton where the sun had found a route to the ground and I climbed to 6000ft under a decent cloud – my height record to date. Then onwards it was back to the fully over cast sky ‘leaching’ off others to stay airborne to give me a chance to make it back. Once the pros had left me for Bidford I kept pushing ahead alone but getting lower and lower in the progress. I gained a few feet scratching around over Kineton but I was still not higher enough to make it back. A field landing looked on the cards but my last hope was to find some lift off the village of Ettington and so I dumped my water and headed towards it. My gamble paid off and I found myself a bubble which slowly took me above glide. Typically I then kept flying through lift but that gave me some extra height to finish my first competition in style with a final beat up of the field. 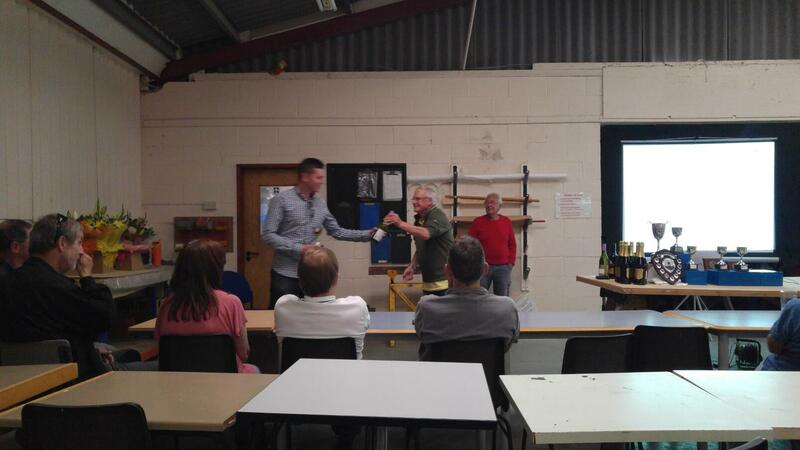 Dan also gets a special mention as he picked up 2 trophies, best junior and top placed in the 15m glider category. You can also download all the traces for each task if you’re super keen. Flying at Bidford was a great introduction to competition flying. It was a very friendly and relaxed atmosphere where everyone was there to have fun, to fly as much as possible and to not take the competing element of the week too seriously. For me it was a great experience doing something I had always wanted to. 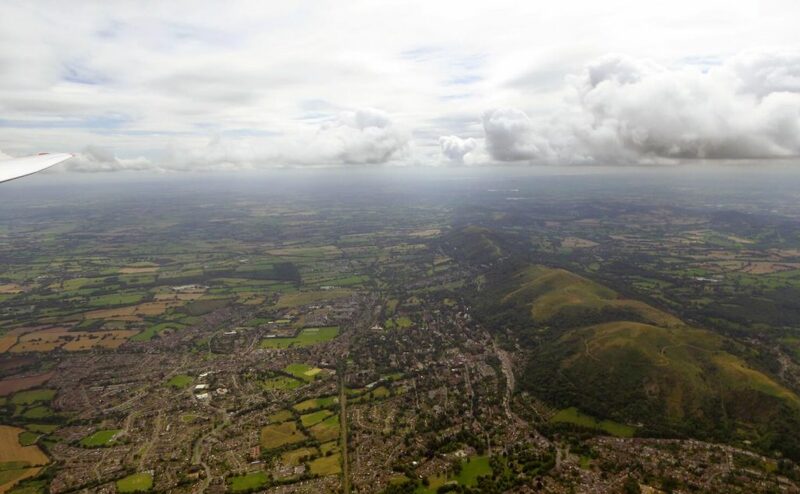 Throughout the week I further developed my flying skills and cross country techniques – all of which should help me fly further and faster in the future. Looking back to my original pre-comp targets I fortunately managed to tick off each one. With the two most memorable being my first field landing and crossing the finish line at VNE whilst dumping my water ballast. Thanks to Dave M for filming this, I’ve being boring many people with this footage of me ever since! I highly recommend it to anyone from our club who has their Silver and wants to try something a bit different. Any lack of experience isn’t a problem at Bidford, there was a pilot from Talgarth who prior to the comp had only flown a maximum distance of 50km. He completed the 250Km task in his Vega earning himself special recognition at the next briefing and a bottle of wine for his achievement. Ben E for being our Crew Chief for the whole week. Not only did he help the Stratford pilots, he assisted all the other competitors. On the days he didn’t manage to bagsy a back seat ride in the Nimbus 4DT he was found compressing and launching the grid and generally getting stuck in with the comp operations. 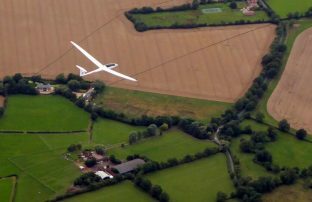 Bidford Gliding & Flying Club for putting on a fantastic comp. It was brilliantly organised with slick operations and everyone will agree Annie’s food was a highlight. Finally to the committee for allowing me to hire the LS4 as without this none of the above would have been possible. 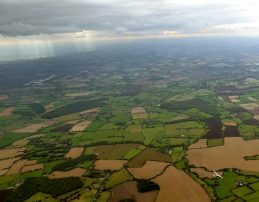 This entry was posted in Flying reports and tagged bidford, competition, cross country, gliding, regionals, sailplanes by Peter C. Bookmark the permalink.